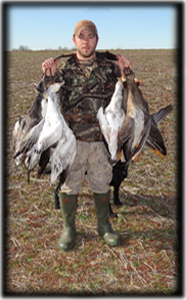 Ryne was born and raised waterfowl hunting in Marion, Illinois. He has worked at Marion Ford since 2004, as an assistant service manager. When not working, he’s waterfowl hunting, deer hunting, or any other kind of hunting. His waterfowling addiction started at the age of 8 when he killed his first Canada goose with his uncle Butch at the Marion City Lake. His waterfowl hunting addiction now takes him from Canada to Arkansas every year with lots of stops in between chasing the waterfowl migration. He has also started filming his waterfowl hunts and helps with filming Fowled Reality.